Event registration is at the core of Circdata’s event technology platform, Fusion. 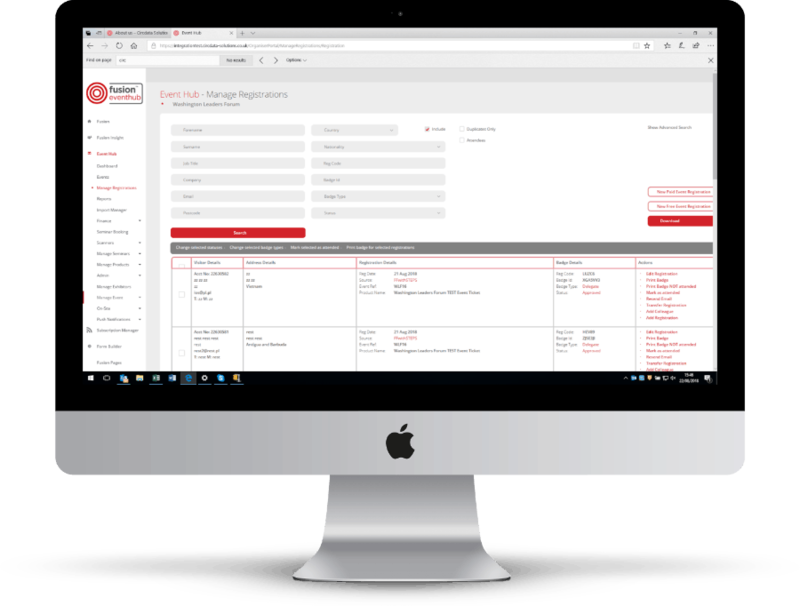 Whether you organise small events or conferences, trade shows or exhibitions, festivals or restricted access events, Fusion’s sophisticated event management tools and database enable you to effortlessly manage your event attendees whether you have one event or a full portfolio. We can support you on-site too. Every week we set up and host our clients’ registration desks at venues across all four corners of the globe. We get their attendees in lightning fast and we can do the same for you. Circdata is the official Registration Partner to the Association of Event Organisers (AEO). Find out more. Fusion offers all the functionality you need to manage your audience and your show features. With a super-simple user interface, you can personalise your entry dashboard to show the event statistics that matter to you the most and links to the reports you regularly need to pull. You can view all the customer interaction you have had with each and every individual, and even the journey they have taken across your show if you engage our visitor app, FusionVisit! We are sure our event registration platform can help you create engaging events, why not get in touch with us for a demo?